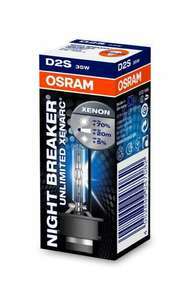 The new Osram night breaker unlimited D2S is best on market. Amazon sell twin pack for £99 which is cheapest I could find on web, but offer on the single pack of £35.67 is delivered and supplied by amazon, but be fast dont think the price will stay low for long.. The new OSRAM XENARC® NIGHT BREAKER UNLIMITED provides up to 70% more light on the road compared to a standard OSRAM HID Xenarc OE bulb giving the perfect road illumination. With a colour temperature of 4350 Kelvin and a 20m longer beam than from a standard HID bulb then the NIGHT BREAKER UNLIMITED is designed for driving in those dark winter nights. Very, very good price! Why the cold votes? I don't think people realise what and how much xenon bulbs cost. Most people who browse around here can probably not afford a car that uses factory fit xenons..
No way to find out, but if you are afraid to buy them from Amazon then the only choice might be to buy _some_ brand from the official car dealership. I would trust Amazon in this case as they might come directly from amazon Germany, i guess bulbs might be also made in Germany. I'm tempted to buy these for my 2002 Laguna II, but then again I've got some (original?) Philips bulbs that should last few more years. My car is 2004 - I'm thinking the same whether fitting new ones will make a huge difference or just stick to what I've got until they've blown. My car is 2004 - I'm thinking the same whether fitting new ones will make … My car is 2004 - I'm thinking the same whether fitting new ones will make a huge difference or just stick to what I've got until they've blown.